Remain hands free and chic with this License Plate Crossbody bag. This sewing pattern is easy and fun. 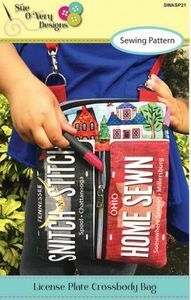 Collect FabricPlates, during the Row by Row Experience in the Summer at different participating shops and whip up this trendy Crossbody bag. At center front are your two FabricPlates with a convenient zipper pocket perfect for cell phones, Keys or other precious items. Along the top is another easy to insert zipper with the D-Rings for your shoulder strap. On the backside is a pocket great for filling up with extra goodies, like your sunglasses or chewing gum.